Cinnamon sticks are typically sold in glass jars. They are brown in color, composed of rolled bark, and are fairly hard, but easily broken and are no longer than an index finger. Cinnamon sticks emit a fairly strong smell of cinnamon as well. Choosing: Look for cinnamon sticks that are not broken and appear to be in an orderly and fresh condition. Buying: Cinnamon Sticks are available in most grocery stores, usually near the ground cinnamon. Purchase from stores with a high turnover for the freshest spices. Most cinnamon sticks available in the grocery store are composed of Korintje (or Indonesian) cinnamon, but other varieties may be available at specialty markets. Left whole, cinnamon sticks can be used as a decorative garnish, used as a stirring stick for warm drinks, or used to infuse hot liquids; remove before consuming. They can also be grated or ground for use in recipes, from sweet baked goods to savory ethnic foods. Cleaning: There is no cleaning necessary for Cinnamon Sticks. As a whole spice, cinnamon sticks store well for long periods. The ideal condition for storing all spices is cool, dark, and low humidity. 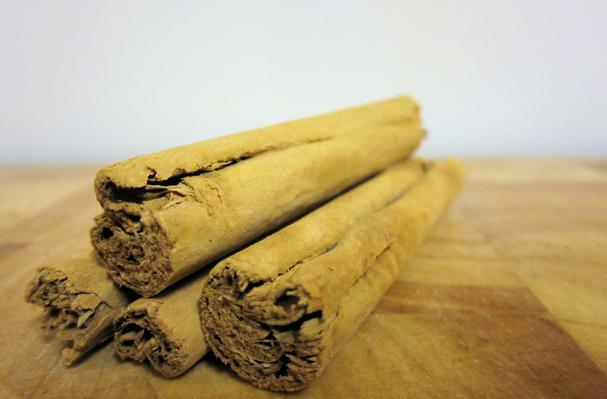 History: Cinnamon has been valued since antiquity.